Louis de Funès (French pronunciation: ​[lwi də fy.nɛs]; 31 July 1914 – 27 January 1983), born Louis Germain David de Funès de Galarza, was a popular French actor of Spanish origin and one of the giants of French comedy alongside André Bourvil and Fernandel. His acting style is remembered for its high energy performance, wide range of facial expressions and engaging, snappy impatience and selfishness. A big part of his most famous work was in collaboration with director Jean Girault, and together, they wrote and directed the French classic L'avare (1980) in which he also starred. He was a household name in several countries of Europe (Greece, Hungary, Czechoslovakia, Poland, Bulgaria, Germany, Spain, Turkey, Albania, Romania, USSR, Iran and Yugoslavia in particular) for many years, yet remained almost unknown in the English-speaking world. He was seen only once in the United States in 1974 with the release of The Mad Adventures of Rabbi Jacob, which was nominated for a Golden Globe. According to a 1968 poll, he was France's favourite actor – having played over 130 roles in film and over 100 on stage. Louis de Funès was born on 31 July 1914 in Courbevoie, Hauts-de-Seine to parents from Seville, Spain. Since the couple's families opposed their marriage, they settled in France in 1904. His father, Carlos Luis de Funès de Galarza, a nobleman and his mother side from family marquesses de Galarza, had been a lawyer in Spain, but became a diamond cutter upon arriving in France. His mother, Leonor Soto Reguera, was of Galician extraction, daughter of a prominent politician from Galicia, senator Teolindo Soto Barro. Known to friends and intimates as "Fufu", de Funès spoke French, Spanish and English well. During his youth, he was fond of drawing and piano playing. He was an alumnus of the lycée Condorcet in Paris, a distinction he shared with Henri de Toulouse-Lautrec, Paul Valéry, Paul Verlaine, Marcel Proust, Jean Cocteau, Serge Gainsbourg, and Claude Lévi-Strauss, amongst others. He later dropped out, and was not successful in his early life; as a youth and young adult, de Funès held modest jobs, from which he was repeatedly fired. He became a pianist, working mostly as a jazz pianist in Pigalle, Paris, where he made his customers laugh each time he made a grimace. He studied acting for one year at the Simon acting school, where he made some useful contacts, including Daniel Gélin, among others. In 1936, he married Germaine Louise Elodie Carroyer, with whom he had one child: a son named Daniel; the couple were divorced in late 1942. During the occupation of Paris in the Second World War, he continued his piano studies at a music school, where he fell in love with a secretary, Jeanne Barthelémy de Maupassant, a grandniece of the author Guy de Maupassant. She had fallen in love with "the young man who played jazz like god"; they married in 1943 and remained together for forty years, until de Funès' death in 1983. They had two sons: Patrick (born on 27 January 1944), who became a doctor; and Olivier (born on 11 August 1949), who became a pilot for Air France Europe and also followed his father in the acting profession. He became known for the roles he played in some of his father's films (Les Grandes Vacances, Fantômas se déchaine, Le Grand Restaurant, and Hibernatus are the most famous). Through the early 1940s, de Funès continued playing piano in clubs, thinking there was not much call for a short, balding, skinny actor. His wife and Daniel Gélin encouraged him until he managed to overcome his fear of rejection. His wife supported him in the most difficult moments, and helped him to manage his career efficiently. Louis de Funès began his show business career in the theatre, where he enjoyed moderate success and also played small roles in films. Even after he attained the status of a movie star, he continued to play theatre roles. His stage career culminated in a magnificent performance in the play Oscar, a role which he would reprise a few years later in the film adaptation. In 1945, thanks to his contact with Daniel Gélin, de Funès made his film debut at the age of 31 with a bit part in Jean Stelli's La Tentation de Barbizon. He appears on screen for less than 40 seconds in the role of the porter of the cabaret Le Paradis, welcoming the character played by Jérôme Chambon in the entrance hall and pointing him to the double doors leading to the main room, saying: "C'est par ici, Monsieur" ("This way please, Sir"). Chambon declines the invitation, pushing the door himself instead of pulling it open. De Funès then says: "Ben, il a son compte celui-là, aujourd'hui!" ("Well that one's had enough, today!"). He went on to perform in 130 film roles over the next 20 years, playing minor roles in over 80 films before being offered his first leading roles. During this period, de Funès developed a daily routine of professional activities: in the morning he did dubbing for recognized artists such as Totò, an Italian comic of the time; during the afternoon he worked in film; and in the evening, he performed as a theatre actor. From 1945 to 1955, he appeared in 50 films, usually as an extra or walk-on. In 1954, he went on to star in such films as Ah! Les belles bacchantes and Le Mouton à cinq pattes. A break came in 1956, when he appeared as the black-market pork butcher Jambier (another small role) in Claude Autant-Lara's well-known World War II comedy, La Traversée de Paris. He achieved stardom in 1963 with Jean Girault's film, Pouic-Pouic. This successful film guaranteed de Funès top billing in all of his subsequent films. At the age of 49, de Funès unexpectedly became a major star of international renown with the success of Le gendarme de Saint-Tropez. After their first successful collaboration, director Jean Girault perceived de Funès as the ideal actor to play the part of the accident prone gendarme; the first film therefore lead to a series of six. Another collaboration with director Gérard Oury produced a memorable tandem of de Funès with Bourvil—another great comic actor—in the 1964 film, Le Corniaud. The success of the de Funès-Bourvil partnership was repeated two years later in La Grande Vadrouille, one of the most successful and the largest grossing film ever made in France, drawing an audience of 17.27 million. It remains his greatest success. Oury envisaged a further reunion of the two comics in his film La Folie des grandeurs, but Bourvil's death in 1970 led to the unlikely pairing of de Funès with Yves Montand in that film. Eventually he became France's leading comic actor. Between 1964 and 1979, he topped France's box-office of the year's most successful movies seven times. He co-starred with many of the major French actors of his time, including Jean Marais and Mylène Demongeot in the Fantomas trilogy, and also Jean Gabin, Fernandel, Coluche, Annie Girardot, and Yves Montand. He also worked with Jean Girault in the famous 'Gendarmes' series. In a departure from the Gendarme image, de Funès collaborated with Claude Zidi, who wrote for him a new character full of nuances and frankness in L'aile ou la cuisse (1976), which is arguably the best of his roles. Later, de Funès' considerable musical abilities were showcased in films such as Le Corniaud and Le Grand Restaurant. In 1964, he debuted in the first of the Fantômas series, which launched him into superstardom. 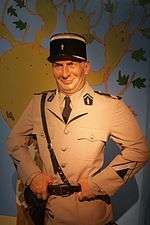 In 1975, Oury turned again to de Funès for a film entitled Le Crocodile, in which he was to play the role of a South American dictator. But in March 1975, de Funès was hospitalized for heart problems and forced to take a rest from acting, causing Le Crocodile to be cancelled. After his recovery, he appeared opposite another comic genius, Coluche, in L'Aile ou la cuisse. In 1980, de Funès realised a long-standing dream to make a film version of Molière's play, L'Avare. Louis de Funès made his final film, Le Gendarme et les gendarmettes in 1982. Unlike the characters he played, de Funès was said to be a very shy person in real life. 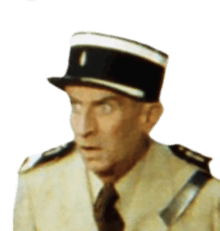 Capable of an extremely rich and rapidly changing range of facial expressiveness, de Funès was nicknamed "the man with forty faces per minute". In many of his films, he played the role of a humorously excitable, cranky, middle-aged or mature man with a propensity to hyperactivity, bad faith, and uncontrolled fits of anger. Along with his short height (he measured 1.64 m (5 ft 4 1⁄2 in)) and his facial contortions, this hyperactivity produced a highly comic effect. This was particularly visible when he was paired with Bourvil, who was always given roles of calm, slightly naive, good-humoured man. In de Funès' successful lead role in a cinematic version of Molière's The Miser (L'Avare), these characteristics are greatly muted, percolating just beneath the surface. In the later part of his life, de Funès achieved great prosperity and success. He became a knight of France's Légion d'honneur in 1973. He resided in the Château de Clermont, a 17th-century castle located in the commune of Le Cellier, which is situated 27 kilometers (17 mi) from Nantes in the West of France. This castle, overlooking the Loire River, was inherited by his wife, whose aunt had married a descendant of Maupassant. De Funès was an aficionado of roses. He planted a rose garden on the château grounds and a variety of rose has been named for him (the Louis de Funès rose). A monument honoring him was erected in the rose garden of his wife's castle. In his later years, he suffered from a heart condition after having suffered a heart attack caused by straining himself too much with his stage antics. Louis de Funès died of a massive stroke on 27 January 1983, a few months after making his final film. He was laid to rest in the Cimetière du Cellier, the cemetery situated in the grounds of the château. Louis de Funès was portrayed on a postage stamp issued on 3 October 1998 by the French post office. He was portrayed as a gambler in the "The One-Armed Bandit" issue of the cult comic book series Lucky Luke. The character "Skinner" in Ratatouille (2007) was loosely based on him. In 2013, a museum dedicated to de Funès was created in Château de Clermont. ↑ Louis de Funès called Stelli Ma Chance ("My Luck") whenever they were together (Louis de Funès : Jusqu’au bout du rire, p. 43.). ↑ "La Tentation de Barbizon". Le cinema de Louis. 12 December 2012. Retrieved 30 October 2016. ↑ Mémoires d'éléphant (Paris 1988), p. 250.